Are you looking for a place to help you keep your New Year’s Resolution to exercise more? Well, stop on over to the newly renovated World Gym Brewster! 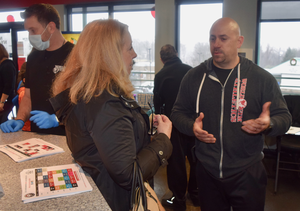 On Saturday, January 5, owners Joe Ciatto, Dr. Paul Ciatto and Dr. Craig Tilden held an open house and ribbon cutting ceremony to celebrate the completion of their state of the art training facility. Brewster Chamber of Commerce Executive Director, Rose Aglieco was on hand to welcome those in attendance. 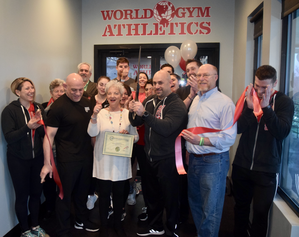 Chamber president, Bill Flash, stated, “World Gym has been a vital part of this community for many years and it keeps getting better.” He pronounced that World Gym was officially open for business as Joe Ciatto cut the ribbon. The 5,000 square feet addition brings the total size of the facility to 18,000 square feet. 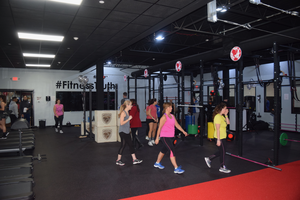 People were encouraged to a tour of the facility and to sample class or two within the gym. 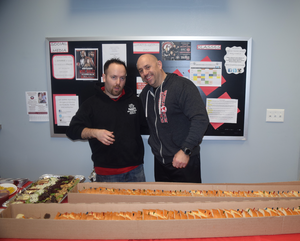 The celebration included free give-aways and refreshments provided by Froggy’s Deli who will be opening this spring in a location right below the gym. “The best way to describe this facility, is that it brings out the best in everyone’s ability,” explain Dr. Tilden, “If people have reached a plateau at other gyms, our coaches and trainers help them get over that plateau and bring them to their complete athletic capabilities.” World Gym works with all fitness levels from beginners to trained athletes. The newest section, World Gym Athletics, includes Brazilian Jiu jitsu, 90 feet of turf, a batting cage for baseball, softball and golf for all ages. “World Gym Athletics has high intensity interval training classes,” stated Joe Ciatto, “We have all types of classes including PACE, Foundation in Performance, TRX, Insanity, Yoga and more.” Professional football player Jake Ceresna will be heading the speed, agility and strength program and retired Baltimore Oriole scout and collegiate baseball coach, Eric Gluck, is on staff as one of their baseball instructors. The Brazilian Jiu Jitsu classes are open to kids starting at 3 years old. This allows for parents to use the gym for themselves while their kids are in class. Plans are under way for a monthly open house where people can come and try out a class. 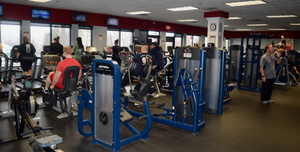 So stop by World Gym Brewster at 1620 Route 22 and check out their new facility. To find out more and check out their class schedule, visit their website or call 845.278.9494. More photos can be viewed on our Facebook Album.